Harajuku girl with lilac hair wearing a fluffy coat with items from LilLilly, Nadia, Tokyo Funks & Cannabis x k3 x Vargas platform sandals. Pink-haired Harajuku girl wearing resale fashion with K3&Co platform sandals and an Adidas sackpack adorned with Yo-Kai Watch plushie. 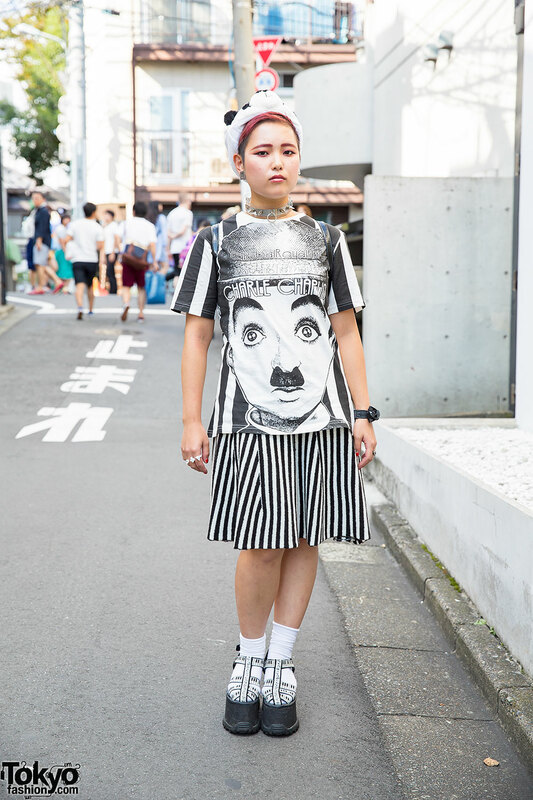 Harajuku girl with short pink hair and panda hat wearing a Charlie Chaplin t-shirt, striped skirt, small backpack, spike choker, Darth Vader watch, and piano platform sandals with socks. Harajuku girl in sequin crown, faux fur top with heart and googly eyes, printed skirt, tight and platform sandals vs. Harajuku girl in printed two piece and rocking horse sandals. Japanese fashion blogger with colored hair wearing a Bubbles Harajuku top, Vision Street Wear skirt and K3 sandals with Style Icon Tokyo socks. Harajuku fashion blogger with red and black streaked hair wearing a flower print smiley face shirt, fishnets, and K3&co platform sandals. Tomomi from the Tokyo salon Valentine wearing Sister Shibuya and FleaMadonna tops and K3&co x Vargas platform sandals. Stylish Harajuku designer with pink hair and a stylish Harajuku girl with blue hair, net top, platform sandals, and Jeremy Scott.